There is a theory that implies once you put 10,000 hours of practice into anything, you will then become a master at it. Lots of people ask me, how long does it take to learn Salsa? Well, you can relax, it definitely won’t take you 10,000 hours (or at least I hope it won’t). However, before I answer the question, lets cover five things that will get you dancing first. 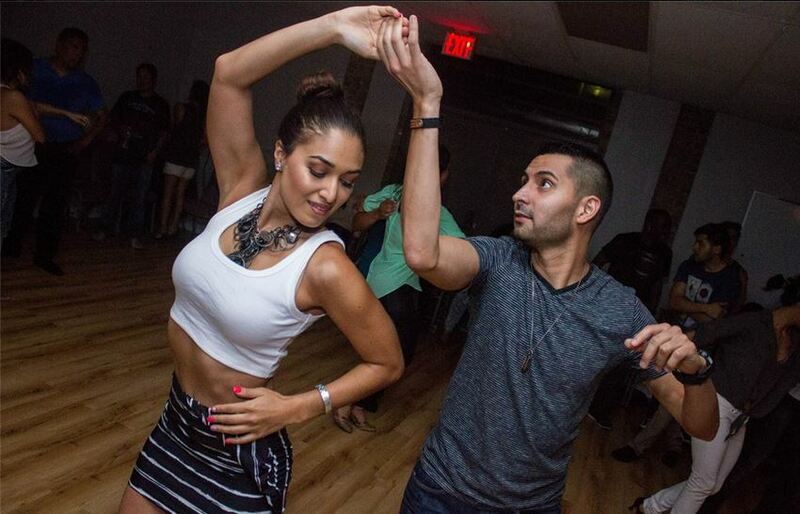 Group classes are probably the fastest and easiest ways to learn Salsa while also being fun. Most salsa schools have what are referred to as drop-in group classes and these usually happen once or twice a week. If you have never done salsa before, this is the easiest way to start. You rock up at a group class and get a quick and easy introduction to dancing salsa. The teacher will usually start the class with a warm-up to get you relaxed and excited. They will then go on to give you a concise version of how salsa works, explaining the basic step and the timing to the music. At this point you will learn a move or two in the class, dance it a couple of times and change partners and voilà – you have begun your journey of learning to dance Salsa. The additional cool thing about group classes (apart from the fact that everyone else in the class is also a beginner) is that it is a great way to meet people. You don’t need to come with a dance partner, so you can come with a friend or even ride solo. Most group classes are set up in a way that accommodates everyone. Listen to salsa music: make sure you understand what you are dancing to and can find the different beats. To take it even further and in the words of Frankie Martinez, when you dance, you must become part of the band by making your body an instrument to compliment what is being played. Once you have taken a few group classes, I would definitely recommend that you take some private classes with a great teacher. In a group class, the teacher is taking care of the group and hence you get no ‘individual personal attention.’ In a private class, its all about you. All your quirks, problems and bad habits will be fixed and you will also get a much deeper and personal understanding of how salsa works. There is, however, one catch: private classes are not cheap. If you can’t afford private classes, you should definitely consider doing some kind of focus group, course, or workshop that runs over a period of time that continually builds off a foundation. You will not learn as much as you would in a private class, but you definitely start to get a better understanding of how everything fits together. Once you have learnt the basics and how to do a few moves, its time for the pedal to hit the metal. I am assuming the reason you are learning to dance is so you can actually dance? Well, then you should be dancing socially. This is the number one guaranteed way to improve your dancing. Imagine going to university and getting a degree, but refusing to get a job in the real world? That is exactly what it is like when you attend classes all the time yet you refuse to get onto the social dance floor. You have all the theory and none of the experience. Set yourself goals and constantly challenge yourself, especially when you are at socials. b. Focus on mastering and perfecting one move at a time. Mastering a move means that you can lead different kind of followers successfully into the move, even if (i) they were not in the class where the move was taught, (ii) they learnt to dance at another school, and (iii) they are an absolute beginner. c. Learn to develop your own style and don’t just be a cookie-cut copy of your instructor. a. Do not be afraid to ask people to dance if they are not asking you. b. Do your best to let go and feel a lead rather than to predict or overthink it. c. Don’t say “no” when asked to dance (unless the person physically hurts you or is verbally or physically inappropriate when dancing.) Start to consider every dance as a learning opportunity, especially with the people whom you do not like dancing with. Challenge yourself to see how well you can follow even the most outrageous or boring lead. Ok, now that I have listed the five things that will make you a better dance, I guess it’s time to answer the question you have all been waiting for. How Long Does It Take To Learn To Dance Salsa? 1. The more time you put in, the faster you will learn and the more you will get out of your efforts. 2. Knowledge, confidence, and creativity: first, you must learn the rules (knowledge), then you must follow them (confidence), and only once you master them can you then bend or break them (creativity). 3. Realise it does not matter how good you become, you will always be learning. Actually the more you learn, the more you will start to realise just how little you actually know. Its a journey, not a destination so just make sure you are always having fun along the way! Any type of practice helps...but which activity helped you improve your dancing the most? I FINALLY learned to follow when I asked 2 male friends (and they graciously obliged) to teach me to understand “leads.” I just didn’t get it. After innumerable group lessons, many private lessons, several socials, and lots of wishing and praying didn’t work, these 2 gentlemen (on separate) occasions, took me aside and each danced with me for about an hour. They helped me pay attention to their hand movements and body language. They reminded me to relax, listen to the music and watch their eyes and smiles for cues. Group lessons prevented me from following because I could anticipate “patterns” and was too tempted to back lead. I’ve stopped taking group lessons except for “shines” to improve reflexes, response and creativity. (I don’t try to memorize.) I’m all smiles and “happy” on the dance floor now. You always gotta search till you find what works for you, but nothing beats social dancing. Great article and list of ways to improve. For those that voted for social dancing, how often do you guys go social dancing? I would suggest social dancing at least twice a week, or you start to forget. Group classes are nice because the partner has just learned the new step and has the advantage of anticipating your next lead. Problem is, it does not necessarily prove that you have properly lead her into the step. Also, I have a partner who has taken many ballroom lessons and instead of following my lead, will ignore my lead and “do her own thing”. One of the problems in being taught by a teacher who also mainly does performance dancing is that they may have less sense of how to go about improvising a social dance. As such their interest is in choreographed dance movements and not in having a good lead or skilled follow that allows improvising well in social dancing. The first step at improvising is to be able mix up your movements order and connect different movements end to end. This increases the complexity of the dance but also keeps the follower from anticipating the next movement. Eventually you can learn by experience to adapt to the follower so when they miss a movement, the lead can substitute a more likely movement smoothly. Finally the lead improves at judging the follow and not asking them to do movements outside of their ability. All of this is progress in giving the follower a better and happier dance experience. I also drill on basic movements twice a week. If your movements are sloppy you will have a difficult time judging your lead movements properly and have difficulty positioning the follower. Because Salsa is some of the fastest dancing in the world, it rewards those with good precision and tight movements that allow a movement execution with a minimum of force and hurry. How long it will take – one factor in the formula may be your current perception about what “Salsa” is, or what dancing in general is. My observation in roughly the last 10 years is that in some teaching systems, a significant amount of people come to think that Salsa (or any other dance) is some specific collection of steps or step patterns. Within this mind set, it takes long to grasp the concept of dancing – some of those people I know personally have had 5, 10 or 20 years of dancing on their backs and didn’t feel “a real dancer” before they started to become more and more friends with the idea that “it’s not about steps”. Real progress per invested time came only after this “paradigm shift”.